Hearthware gourmet coffee roaster belongs to the school roaster category, the category that Sirocco roasters are in. 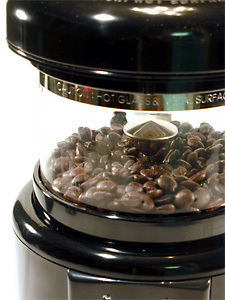 This gourmet coffee roaster uses hot air stream to roast in a glass orb and the chaff is neatly collected in the lid. Labeled as a fluid bed roaster, it functions like a hot air popcorn popper and agitated the beans with its different air vent sizes and a center rotation. It can roast between 3-4 ounces of beans and this hearthware can roast more than the newer version, possibly due to the lower fan speed. As if functions like a popcorn roasters, all it takes is to pop in the beans, set the timer (which takes about 8 minutes including cooling time), take out the beans and clear the chaff. If you so want, you can alter the roast times by turning the timing to half dial instead of the full dial, this allows you to change your roast. Regardless if it is hearthware gourmet coffee roaster or any roasters, cleaning is an important element to note. Left over chaff affects the roasting process and to some extent affects the aroma of the roast. This gourmet coffee roaster ease of cleaning can be credited on its excellent chaff collection. While some chaff might pass through the lid collector, it is in general able to collect and rid off most of the chaff. Sure, the hearthware gourmet coffee roaster is probably a much simpler roaster without the bells whistles of its newer siblings. However, its ease of use, allows you to have a quicker operation. With a faster turnover of the roasting, you can roast more batches with this than with any other roasters. As it is a more basic type of roaster, hearthware does not cater to the finer elements and one of them is noise. This roaster howls. If you are thinking of using it to roast at home, you probably should not do it when your family members are home or you might get you and this machine thrown out of the house! Yes, this is how amazingly loud this fellow can get. However, other than this loud problem, it is a breeze using the hearthware gourmet coffee roaster. Where else can you find something at $60.00 that has no problem doing multiple batches of roast quickly and is easy to clean? Find coffee makers to brew your roast?